The November 2015 Aquarius Horoscope predicts that most of the planets are in the upper part of the chart towards your midheaven sign. Career and outward personality will be important over domestic issues and psychological matters. You should work hard towards achieving your professional goals. In November 2015, you are free to decide your objectives and your life path. Though there is no need to be flexible and get help from others, it is prudent to be friendly with others while you push your agenda for success. The Aquarius November 2015 monthly astrology predictions show that the month is highly favorable for your business and job. There will be recognition and rewards with promotions and financial benefits on the work front. Your status in career will improve and the whole family will encourage you to attain your goals. Legal business problems will be resolved amicably. 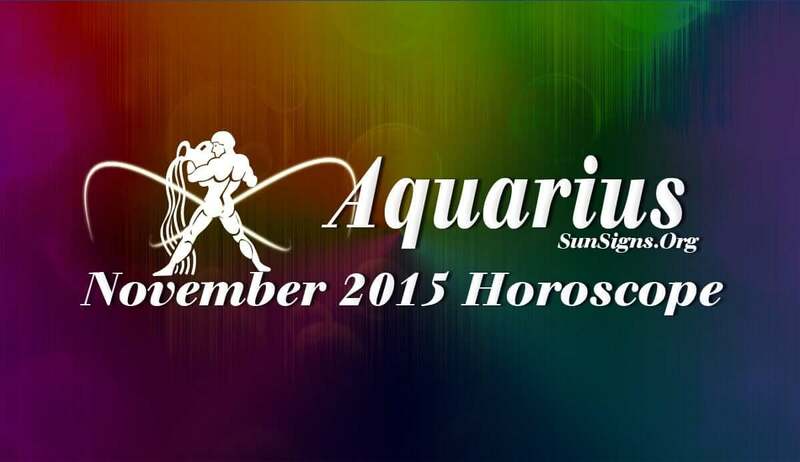 Monetary situation will be tough in the beginning of November 2015 for the Aquarius zodiac sign. But it will become better during the latter half of the month. Earnings will come mainly from your profession. You should think twice before making large scale purchases or risky investments. In November 2015, romantic relationships will be volatile for the Aquarians. There is no clarity in your commitment. Relationship with your partner will see many ups and downs. Pregnancy might get delayed. Singles are likely to get married if in a serious relationship. Love relationships and friendships will be tested and good ones will become stronger and weak ones will fold up. Know what your passion sign reading has to predict for you. The November 2015 Aquarius horoscope predictions show that health will be satisfactory in spite of stress from professional sources. Take sufficient rest till the third week of the month and divert your attention to essential things. Changes in fitness and diet routines are likely. A stiff neck or back pain might trouble you during the month.